Home Dividend InvestingDividend Investing Glossary	How Can Investors Receive Compounding Returns? Investing is crucial. People need to save money to finance their retirement. They also need to save money to pay for things such as sudden emergencies. If you are an investor or plan to be one soon, you’ll want to understand some core principles to make the most of your capital. One of the most common questions I get is: How can investors receive compounding returns? First, let’s take a look at savings accounts. Basic savings accounts tend to pay very little interest. A few pennies each month won’t add up to much. The idea is to put your money to work and start receiving compounding returns. Your basic goal is to earn interest on the interest. That is what they call compounding returns. This will grow your nest egg much faster. Let’s dive a little deeper. Suppose you invest $5,000 in an investment account that earns 10% interest yearly. Leave the money in the account for a year and you’ll have $5,500. Don’t touch the account and the you’ll earn additional interest not only on the $5,000 of your initial investment, but also on the extra $500. This is a good way to sock away funds you’re not in need of right now. If you are new to investing, you’ll need to start with the basics. Look into setting up a 401k, 403b or an IRA account. Over time, these investment accounts will continue to grow, earning compounding returns on the interest. If you’re wondering how you as an investor can earn compounding returns, you’ll need to look for investments that pay compounding returns rather that what is known as simple interest. Opting for simple interest gives you interest only on the basic investment capital of the investment. Compound interest adds an extra layer of interest and therefore an extra chance to earn more money from your investment capital. Many loans are based on simple interest. You take out a car loan and you agree to pay it back in a few years. You’re not charged the amount the capital would have earned in interest. This is something homeowners know all to well. 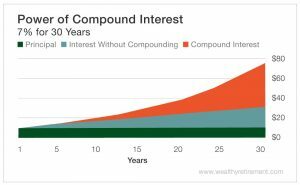 As an investor looking for compounding returns, your goal is to find an investment vehicle that offers you guaranteed compound interest. Look closely at the terms of any financial agreement in front of you. Most of the time, individuals in search of the highest possible rate of return on their capital, are better off with compounding returns. This will help you on your way to a wealthy retirement. Click here to access our Compound Interest Calculator and unleash the power of of compounding returns!